Over at io9, Charlie Jane Anders asks a fun question: “What’s your favorite novel that defies genre classification?” In the discussion that follows, a number of books were trotted out, including thick novels by Mark Helprin and John Crowley. But I didn’t notice my favorites. So I’ll list them here. First, there are two ultra-early classics of the meta-novel, Tristram Shandy and Jacques the Fatalist and His Master. These are joys to read, but certainly don’t fall within the usual formulae of novel-writing. Similarly, Finnegans Wake takes off with the prize; it certainly isn’t easy to categorize, unless, like me, you designate it as the world’s longest nonsense prose poem. But, more in keeping with later genre writing are four classics of “fantasy.” The word deserves the scare quotes because, well, they aren’t just, or quite, fantasy as we usually think of it. 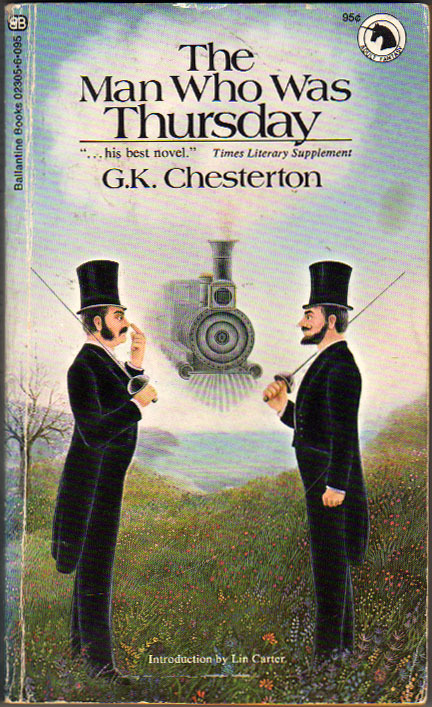 G. K. Chesterton’s The Man Who Was Thursday is a true original. It is a satire. It is something of a mystery. It is a spy novel. It is a contemplation of anarchism and statism, both. And it goes off the rails into totally weird territory with its bizarre ending, one of the most outrageous in literature. Mervyn Peake’s Gormenghast trilogy, on the other hand, is world-building, fantasy of a different order, but it doesn’t go all mystical towards the end. It is, in a sense, a satire on the conservative temper, and a paean to non-compliant individualism. Though called a fantasy novel, Titus Groan contains no magic — other than its very effective literary technique, grotesquerie and ultra-Dickensian one-upmanship. Gormenghast, its sequel, carries on this amazing concoction flawlessly, to a rousing conclusion. Titus Alone brings us into a bizarre world later explored by the likes of Jack Vance, Michael Moorcock, and Gene Wolfe. It is science fiction, not fantasy. But its focus is always at the individual level. It is also, alas, not flawless. I sometimes think of the Gormenghast trilogy as a duet, with forgettable coda. But perhaps I merely need to re-read the three books in order. 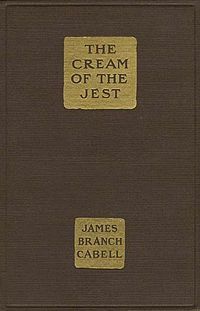 Next, I come around to my favorite meta-novel, James Branch Cabell’s Cream of the Jest: A Comedy of Evasion. This work is a dream novel; a languorous high fantasy; a clever anti-romance set in the world of the genteel-tradition South. It contains a chapter on the conversion of the main character to Christianity, very much like C.S. Lewis’s later actual conversion, related in the memoir Surprised by Joy. But it’s not exactly a wholly serious theological event, and most readers cannot help but infer some caustic irony in this droll take on religion. And yet, in his own non-fiction accounts of his Episcopalianism, Cabell advanced the logic of hesitant acceptance as his own. Cabell, who in more outrageous fantastical modes (say, as in Jurgen and The Silver Stallion) regaled us with the vast bureaucracy of the afterlife and the heavens, offered a Christianity that it would be difficult to get very excited about. No wonder Lewis hated Cabell. And yet they are such similar fellows: Anglican Christians who loved romance, loved the ancient myths and fairy tales. But they parted company, for Cabell understood what really made the world go round, and developed a jaded philosophy to incorporate lust and the unobtainable ideal. Lewis made certain to make sure that ideals were utterly obtainable. While Cream of the Jest seems to me a great masterwork, woefully unappreciated by academics who (rightly) drool over Nabokov’s even more outrageous jests, Cabell’s other masterpieces are mostly easier to confine within a genre — with a few receiving the requisite drool from die-hard fantasy readers. The Rivet in Grandfather’s Neck is a comedy of romance, entirely realistic. The High Place, “The Music from Behind the Moon: An Epitome,” and the tales in The Silver Stallion are all high fantasy, if with deep comedy and a pointed philosophy at base. Smirt, Smith and Smire are three dream novels, “extending the realism of Lewis Carroll.” Hamlet Had an Uncle is a grim retelling of the stories that Shakespeare transformed into his greatest play. The only other true genre-buster is Beyond Life, a bizarre excursion into the territory of the literary manifesto, written in the form of a fantastic dialogue and containing a discussion of the world’s greatest book collection. Mention of literary criticism reminds me of C.S. Lewis’s best non-fiction book, An Experiment in Criticism, a curious work that defends fantasy from the rather puritanical snubs of the critical snobs. In it you will find much to exercise your mind, but no defense of Cabell. But this meandering into the oeuvre of Tolkien’s erstwhile friend is not without purpose. Not only his his experiment worth consideration for fantasy and genre-bending literature, Lewis also produced one of the great masterworks of genre-busting fantasy, Till We Have Faces. As a novel that basically serves as the author’s answer to Job, there is nothing like it. And since it is also an extraordinarily moving and intelligent retelling of the Psyche myth, it, too, defies easy categorization, and thus deserves mention in the same breath as the greatest work by Chesterton, Peake, and Cabell.